I arrived cold, tired, and muddy to the town of Hornillos del Camino. The only people I saw outside, shuffling around, trying to stay dry, were pilgrims. Lucky pilgrims who had arrived earlier than I and were staying in the municipal albergue. Little to occupy the pilgrim here takes on a whole new meaning on an overcast, wet, drizzly day when you need space and air circulation to get boots dry. There were few joyful faces around, as the grayness of the day seemed to soak into people’s flesh and made everyone gray. One exciting thing that happened was that a man passed out while standing under an overhang, probably while admiring the nothingness of the day and realizing that the next day would probably bring more of the same. An ambulance from a few towns over arrived quickly and he was OK. The person who operated the albergue was doing double duty today as the town cafe owner – her assistant hadn’t shown up – and was in the midst of supplying meals for hungry peregrinos. Those of us who had arrived during lunch would have to wait until food time was over and she could get away. Before she had left to start cooking for the lunchtime crowd, she had handed out slips of paper with numbers for the first lucky 50 pilgrims. 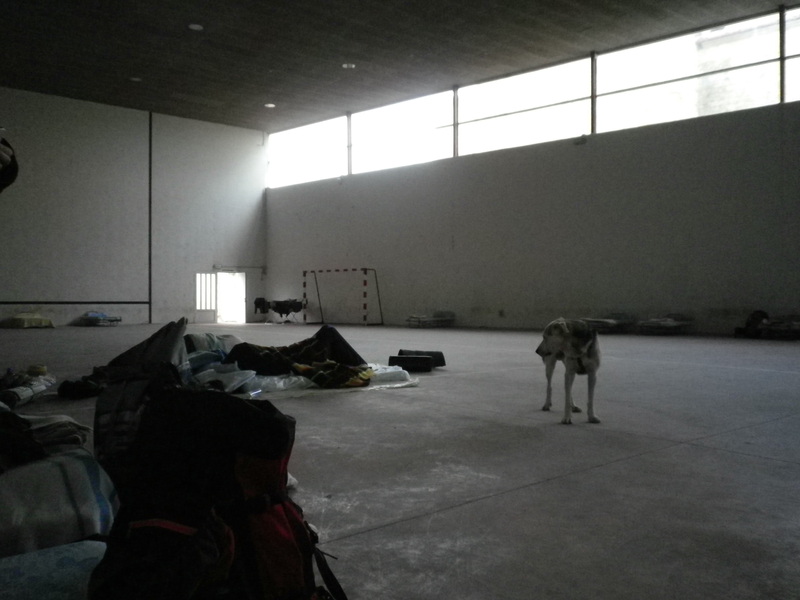 They would get a nice place to rest – 30 in the albergue, 20 in the town hall. The rest of us were assured we would be able to stay the night, but where? We waited in the albergue’s dining room. Small, dimly lit and damp, it contained a vending machine for coffee and one for soda, a trash can, a stove, and some kitchen items. It also contained about 25 wet people, searching for a place to rest their packs and their backs. After about 2 hours, the tired hospitalero finished her duties at the restaurant. Those with numbers lined up, paid their fee for the night, and were sent off to find their assigned bunk bed. Another hour and a half later, it was time for those of us without numbers to learn our fates. I paid my fee, letting others go ahead of me in line although I had waited longer (Why be in a hurry? We’re all going to the same place at the same time, and I didn’t want to stand in line). Finally she said, follow me, and we dutifully did. I lost sight of them because I had to put my boots back on and hoist my pack. I asked others outside in the drizzle where the group had gone and they pointed around the corner. There it was, my hotel for the night. 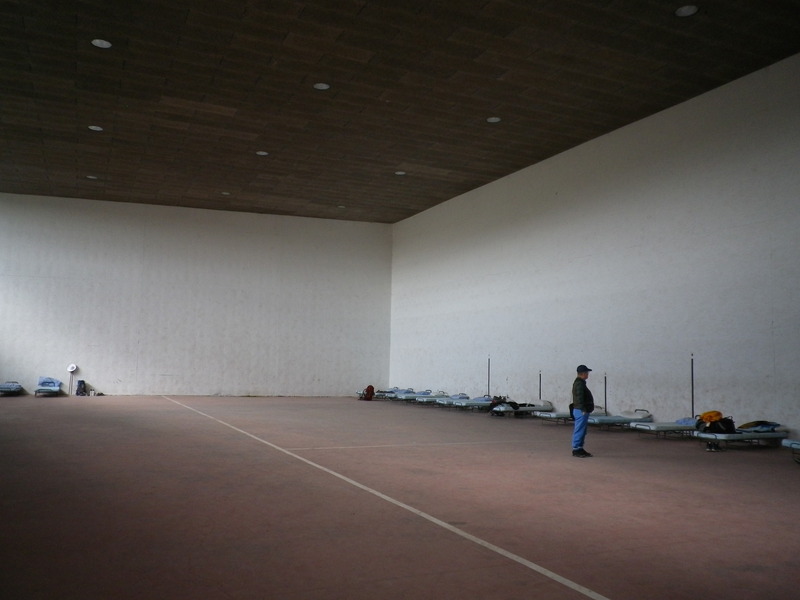 The gym had probably been changed into peregrino overflow housing when the town realized there weren’t enough people to justify a gymnasium and they could make money charging for cots. I think it made sense and probably would have suggested it, if I had been a resident of the town. 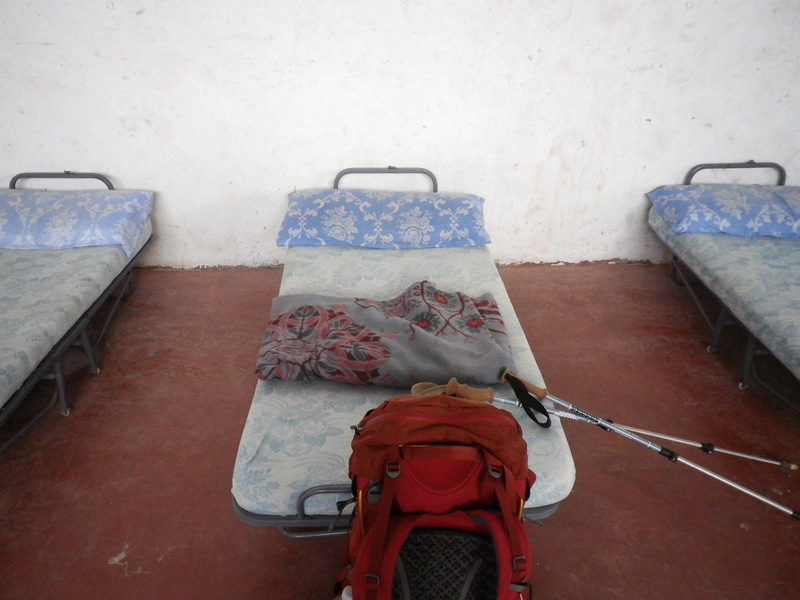 Metal cots lined the walls with a few mattresses on the floor for real overflow bedding. The bathroom was modern and clean (cold water only) although you had to go back to the albergue for a shower, which meant a walk in the cold rain. There was mold slowly creeping up the sides of the walls where they met the floor. Peregrinos started to use the soccer goals stored there to spread out wet clothes. The under-appreciated hospitalero handed out blankets to all who needed. I felt sorry for her, knowing that many would complain about what they would see as a new low in pilgrim accommodations. From my point of view, however, it was dry, cheap, and the temperature was comfortable. I wasn’t going to sleep touching the wall so I didn’t worry about the dirt and mold there. It was the roomiest space I had ever stayed in my life and I wasn’t sharing a bunk bed. I was OK with this and knew it would be something to tell the folks back home. It was where refuges live in camps on CNN. And I truly was grateful and happy with this warm, dry, place to stay the night. The large gymnasium windows along the top let in all the light (there were no lights in the building) and I enjoyed the sound of hard rain as I fell asleep. The heavy breathing in my ear the next morning would have, in a previous life, awakened me with a start. Instead, I pulled the sleeping bag over my head and dug deeper inside, vainly trying to block the sound out. But I slowly realized that heavy breathing not accompanied by snoring wasn’t the usual sound heard in an albergue. I poked my head out, found my glasses, and looked around. About two feet from my bed, where nothing had been the night before, was a large dog. Two, in fact. Curled up next to their people in the other cots who had snuck them in during the night. The dogs were well behaved and as clean an anyone else in the gymnasium. The downpour of the night before ensured that the day would be full of sticky mud and I was glad I hadn’t rinsed out the zip off bottoms of my pants, which I realized worked great as gaiters. I packed up, nicely rested, and started to walk to Castrojeriz. This entry was posted in camino de santiago de campostella, Spain, Travel and tagged backpack, Camino de Santiago de Campostella, pilgrimage, Spain, Travel, women hikers. Bookmark the permalink. Enjoying your blog but where’s the rest? Hope you are doing well on your Camino and just haven’t had time to write. Amen! Many things in life take on new meaning on the Camino.Many thanks for your comment.